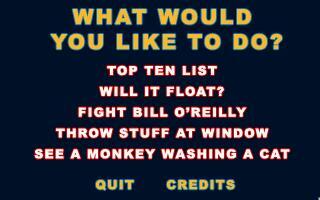 Now you can play Will It Float at home, browse top ten lists, and even throw stuff at the window! "Doesn't really offer much in the way of gameplay for the large download and the ripped graphics have some poor animation. Ardent fans of Letterman may still enjoy it, though." Not an adventure game at all, but interesting for a once-go.